The seller on top of the list is OOO Yuniteknefteprodukt. By clicking on the company's name will we find more information, where the company claims: "We "YUNITEKNEFTEPRODUKT LLC" are reputable registered mandate company in Russian Federation for Petroleum/Petrochemical oil and gas products. We have direct access to numerous genuine sellers which makes our delivery distinctly unique. 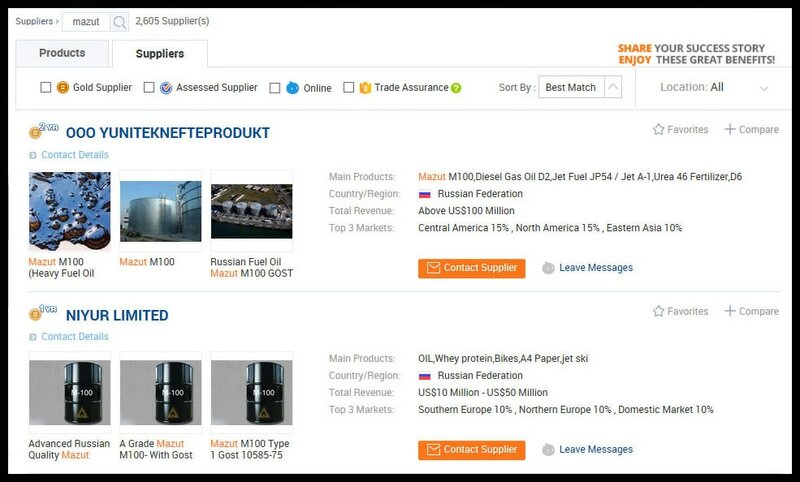 "YUNITEKNEFTEPRODUKT LLC" is a registered trading company since 2005 which based in Russian Federation and its headquarter located in Moscow which acts as a Mandate company for introducing REAL Buyers to reliable end Sellers/Refinery that specialized in offering wide arrange of Petroleum Products that are sourced from best manufacturers and processing units from Russia." Their claim to be a mandate for "genuine sellers" is a big, red warning light. All major oil companies in Russia have issued warnings against mandates. They never use mandates, because they sell the oil themselves. The address is found after a minute's search on internet, in this case on ec21.com: "Street Mariupol, 6, office 28 Moscow, Moscow." Мариупольская улицы = ​Mariupol(s) street. ​Google Street Maps shows a building, but it is unclear whether it houses offices or apartments. This is a yellow warning light. The telephone number is also found on ec21.com. It is 7 - 499 - 3907875. The country code to Russia is +7. The area code 499 is for Moscow. Note: Some Moscow have area code 495. Some of those numbers are virtual numbers, which means that the holder can be anywhere in the world. ​The contact person is Verstakov Ilya Arkadevich. A Google search for this name resulted in two fraud alerts on the first page. This is definitely a red warning light. Order a report from Interfax Spark, which gives access to a database with millions of registered entities in Russia, Ukraine and Kazakhstan. ​Use the service of our investigator in Moscow, which is an expert in economical crimes.